Some of you may know, I've been looking for another toy - a second midlife crisis, if you will - to help me deal with my recent 40th b-day. My 1st midlife crisis was my early 30's when I got Marilyn. So I've been blessed to be able to get my 2nd toy, so I have been racking my brain for quite some time now. I was looking at another sports car - had to be a convertible - so I was looking at various options... Terminator, Shelby, Viper, Vette, M3, S5, etc... I got close to a Terminator, I even put a deposit down for one, but ultimately cancelled that out. So... her name is Wruby! 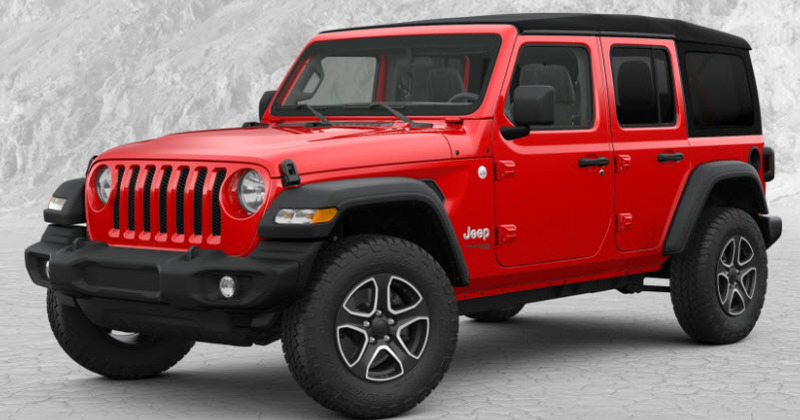 I decided on a 2018 Jeep Wrangler JL Sport S!!! I did not need a Rubicon model top-of-the-line, because I’m in Iowa and there aren’t any canyons or boulders or rocks to climb… LOL. Premium soft-top, safety group (blindspot, etc. ), technology group (Apple carplay, 7" screen, bluetooth, etc. ), and stickshift of course!!! I've always been a Wrangler fan for a while. Now that my kids are growing up and soon to be teens, I'll be doing more outdoorsy and sports stuff with them. Also, I decided against a sports car because, I already had Marilyn - and getting another fair weather vehicle would reduce my mileage on both cars by half, and I wouldn't get to enjoy both vehicles like I want. With the Jeep, I may not drive her during snow, but at least I can drive her when it's cold out - in other words, I'd get more use out of her. I also heard that the wranglers have a devoted following as well, so I will be on their forums also. They have dedicated jamborees and get together’s locally and out of state that I want to partake too. Sounds like a bunch of crazy people as well. Just like us mustang lovers. So I ordered her this past weekend, and will take 8-12 weeks to arrive. The only thing is that I can STILL change her color. Can you guys help me decide on the color? For now I picked Firecracker Red, but always loved Granite Crystal (like a gunmetal). The gunmetal grays are so common lately, and it is literally the leading color on at least our local dealer. Here's a pic of the vehicles off the builder site. What do you guys think? Red or Granite? Last edited by FromZto5; 3/27/18 at 03:02 PM. I'm fond of the red. Between the gray and red pictured I'd definitely go with the red. I'm assuming you went with the 4-door, is that right? That's a killer combo, especially if you're thinking you'll ever sell it. 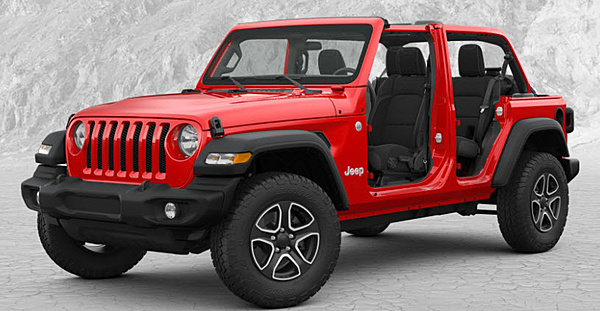 Who doesn't like a red Jeep? But ... did you really say you won't drive the Jeep in the snow????? I like both colors, but I like the Firecracker Red. Looks pretty bad ***. Again, congrats and keep us posted bro. Thanks Gabe! I got really close to getting another sports car, but I thought of my kids and my oldest will be driving in 5 years, so I figured I’d teach him stick in this, rather than Marilyn or another pristine car... not gonna have him grinding gears. No sir. And yes, definitely 4 doors. Unlimited. I test drove both the JK and the JL and it’s a night and day difference! I love the new JLs. They ride so nice and the interiors are so much better. I also wanted cloth seats - I don’t want leather. And thanks for the red advice. I figured you’d say gunmetal since your car is!!! Thanks Tony! I’ll definitely keep you posted. Sounds like everyone says red! But yes, the choice of the vehicle itself was hard... more so the color. We all have to make these choices, this is what I ordered after the sale of my 2011.. So this morning, I received my VIN!!! It's also in D status, which I think means they've accepted the order and it should take about 8 weeks or less, from what I'm seeing in the other forums. I'm still in shock that this is actually happening. I haven't had a "new car order" feel since I ordered Marilyn. Quincy (my Infiniti) was new, but was on the dealer lot... so it wasn't as "fun". The other thing I've been debating is going back to the "standard" silver plain jane wheels. Why? Because I'm going to be customizing it anyways... I'll be getting custom wheels and slightly bigger tires, so I would use the stock plain silver wheels for my winter set. (So, yes Gabe... "maybe" I'll drive it on snow ) It might be moot, since if it's in D status, maybe it's locked in already. No biggie. What you guys think? I look at Wruby as a blank canvas for mods I even plan to maybe put in a blower. hehe. Also - I'm starting to look at side steps. I was think of these two... thoughts? I like the second. Anything else you suggest? Last edited by FromZto5; 3/28/18 at 09:12 AM. I like the second step as well. I'm late to the game, and both colors look good, but I'd go granite You'll have fun with the Jeep! My dad bought one last year as a DD and tows it behind his RV. I like the second set as well. Congrats I just ran across this article. I like the second step as well. Put me down for step #2 as well. "they suffer from limited passenger comfort, harsh and erratic ride and handling abilities and excessive wind noise at higher speeds." I'm sorry, but if you don't EXPECT all those things with a Wrangler, then there's something wrong with you, or you're just 100% oblivious. I sold Jeep/Chrysler vehicles back in 2002 when the Rubicon was just coming out, and I loved selling Wranglers ... I always made money, people were buying them on feeling, and they knew what they were buying. They're awesome for what they're supposed to be. Knocking a Wrangler for highway speed noise is like knocking a Bentley Continental GT for not being to carry 2 full-size refrigerators in its trunk. Thanks Gabe!!! Yeah, those were just my first 2 choices. There's more obviously - actually, there are a TON. The aftermarket following for this vehicle is insane. As I am learning. Thanks man! You are honestly the first person to say Granite, out of maybe 20+ people I've asked. Don't get me wrong I love Granite. But it's too late anyways. I am set on red and can't change it!!! "thanks" I guess? Lol Glenn. If you guys know me by now, I research the pi$$ out of my vehicles. And as Gabe stated, I know all this going into it. But it's just a cult vehicle I've always loved. It's not an everyday vehicle for me, plus, I can't wait to work on her if something does go wrong, hence why I have a lift. Bring it on. I bought it for the fun factor - not the reliability... time with my boys. I'm excited about the opportunity to own such a niche vehicle. Thanks Tony! Noted!!! I have more mods to get your opinions on. Amen Gabe! Well said. As I mentioned above, bring it on. These vehicles are so easy to work on, it's not even funny. Btw, I have about 5 friends locally who have had Wrangler JK's for years... and they all want to be buried in them. It's part of the reason why I'm getting one. Owners just love em to death, despite their negatives. Second step choice here as well. Have to agree with you guys. I wouldn't mind having one as well. I would love to get one thats a few years old and slap a cobra engine in there. Gabe - before I forget, I didn't comment on the speedo being off. So, just like our ponies, I can get a handheld programmer for like 100-200 bucks that will allow me to quickly change the ratios so that it's all accurate. That way, I can switch between normal sized tires in winter, versus bigger ones in summer. No biggie. Welcome to the mud and snow side! (Guess you could call it the Dark side.) And yes it is OK, even a encouraged, to have dirt on your JL. Love my Jeeps, course I have been a Cherokee/Grand Cherokee guy for a long time. On number 5 (1 Cherokee & 4 Grands). Have two JGC's parked in the garage next to my Roush. A 2012 white Overland (wife's daily with only 36k on it. And yes it is spotlessly clean), and a 2017 Trailhawk. Love that Granite Crystal on the TH, but considered the Redline Red. Wife just could not do it. But the Red was a very nice choice for your Unlimited. Sounds like you are going with the soft top? Black or painted fenders? Last summer I was dealing on a couple of '17 Unlimited Wranglers in the Rubicon Recon. Of the two I was dealing on one was Black (with Red accents) and the other was Firecracker Red. Really liked the Red! But in the end I just could not give up some of the lux items found in the JGC so I came back to the old familiar. Tough for an old guy to give up the power seats. rain sensitive wipers, and adaptive cruise. Still wondering if I made the right choice. The '18 JL is supposed to be a major upgrade over the '17. I will have to watch your thread and see how you like it. Love the looks, can't wait for the pics! Burton, did you go with the 3.6 V6 or the new turbo 4-banger? I heard great things about the 4, but I'm thinking you went with the 6. Hey Gabe awesome videos! Thanks for sharing. Watched them both all the way through. Now I want to go buy me an '18 Unlimited!